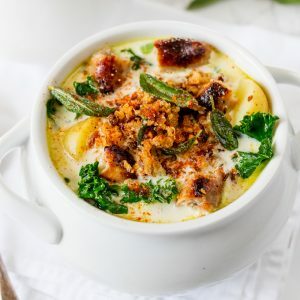 Creamy Sausage Soup with Buttered Breadcrumbs and Sage – a proper posh soup! This post is sponsored by Love Pork. Stranded on a desert island with one food to take with them, sausages would be the hands-down winner for my kids every time. When I was younger, I remember sausages being served in one of only three ways – sausage butties, sausage and mash or toad in the hole! Jump forward 30 (ish) years and I’m amazed at the delicious creations people make using sausages. 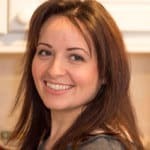 Even though I only made a sausage recipe last week (check out my sausage and bean casserole here), I’m cooking up another one to celebrate British Sausage Week! 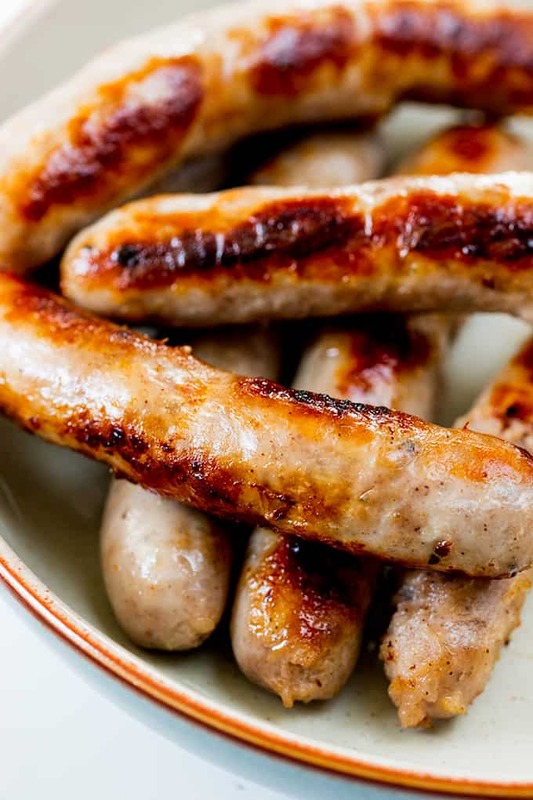 If you didn’t know, British Sausage week runs from the 31st October to the 6th November. It’s now in its 18th year. British Sausage week promotes sausages that are made from quality or Red Tractor sourced pork from Britain. Sausages that depict a Red Tractor logo are traceable and have been produced responsibly ensuring that it is quality food you can trust. So get your frying pans out! 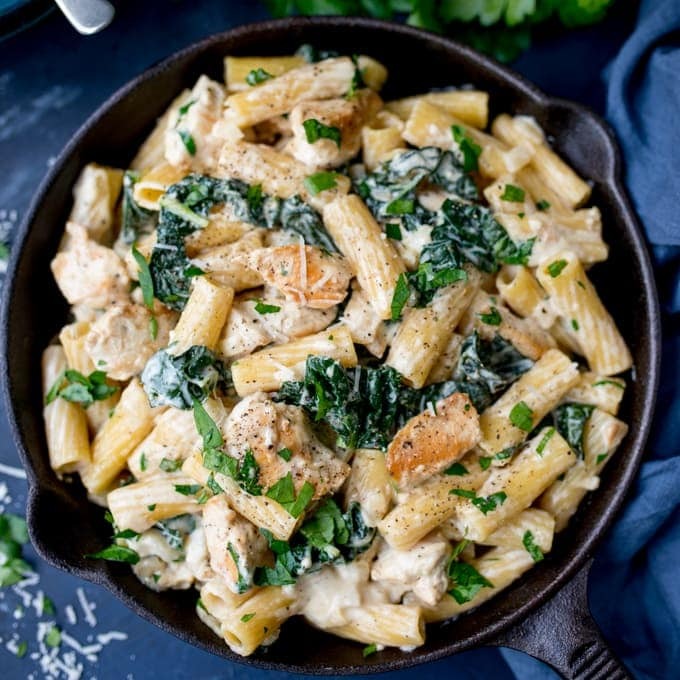 Always a great option for a quick, inexpensive and tasty mid-week meal, you can even cater for individual tastes with all of the amazing varieties on offer. On my last trip to the local shop I found chorizo and red pepper, caramelised onion, and pork and apple flavours (chorizo was the favourite – so good in a roll topped with some sweet chilli sauce!). I made this yummy soup to show off the quality of pork sausages being produced today by British pig farmers. 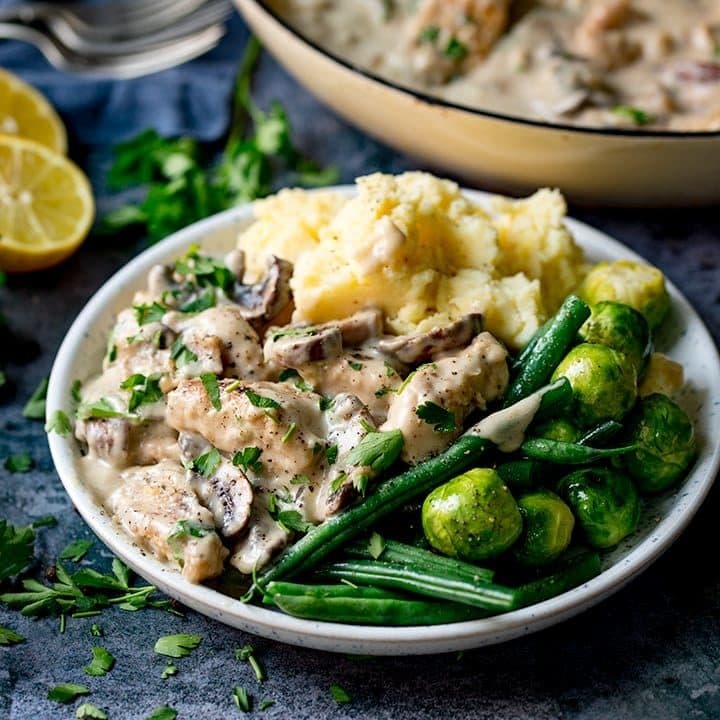 Pork sausages with a hint of black pepper, cooked up in a creamy soup with baby new potatoes and buttery kale. Ever the toppings girl, I couldn’t resist adding some breadcrumbs crisped up in a pan with salted butter and a few baby sage leaves to finish the whole thing off. 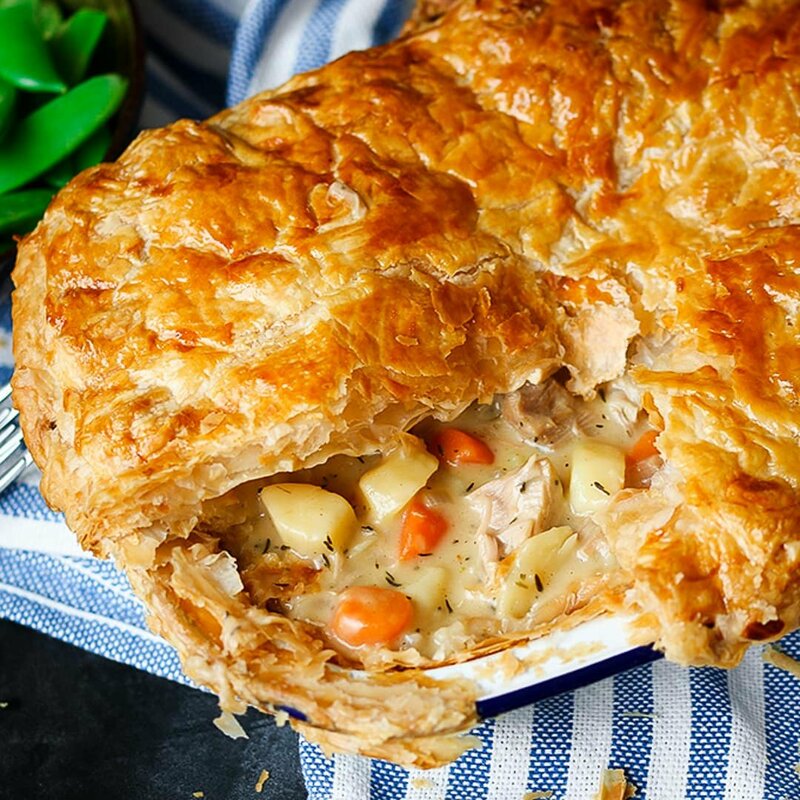 Great for a posh lunch, but filling enough for dinner too. 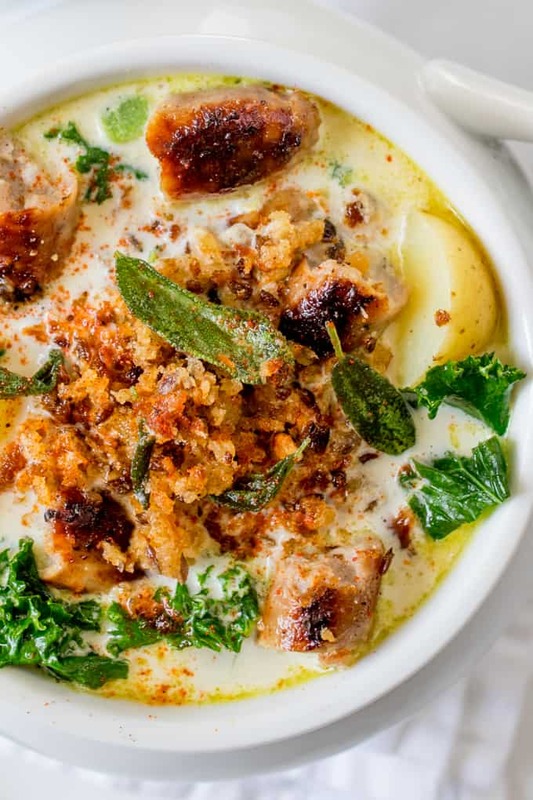 Creamy Sausage Soup with Buttered Breadcrumbs and Sage - a proper posh soup! Heat the oil in a large sauce pan, add the sausage and brown for 5-6 minutes. Add in the onion and garlic and cook for a further 3 minutes. Then add in the potatoes and stock. Bring to the boil and simmer for 15-20 minutes, until the potatoes are tender. Whilst the soup is cooking, make the toppings. Heat 2 tbsp of the butter in a frying pan (skillet) until bubbling, add the breadcrumbs and heat on a high heat for 1-2 minutes, moving around the pan a few times, until the breadcrumbs are golden brown. Remove from the pan, carefully wipe the pan with some kitchen roll and add the remaining 1 tbsp of butter. Heat until bubbling and add the sage leaves. Cook for 30 seconds, then remove from the pan. 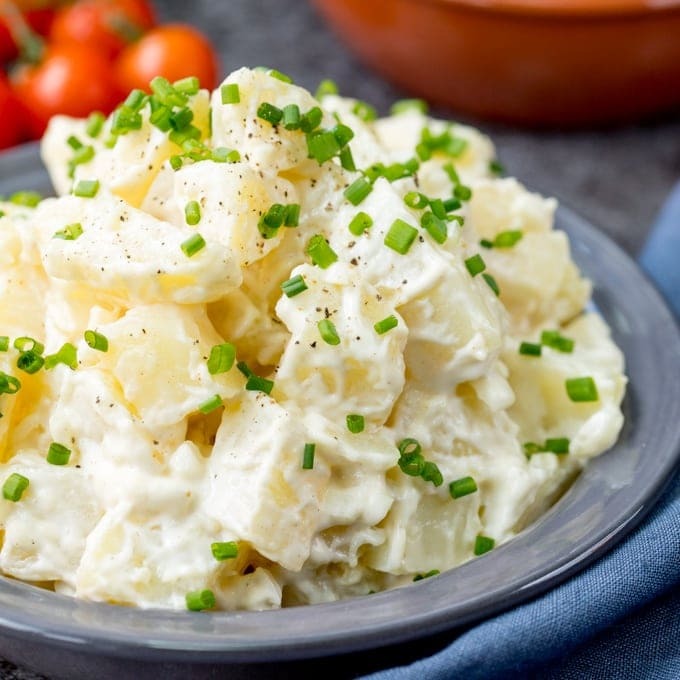 Once the potatoes in the soup are tender, add in the cream. Heat through until almost bubbling, then add the kale. Give everything a stir. Taste the soup and add a little salt and pepper if needed. 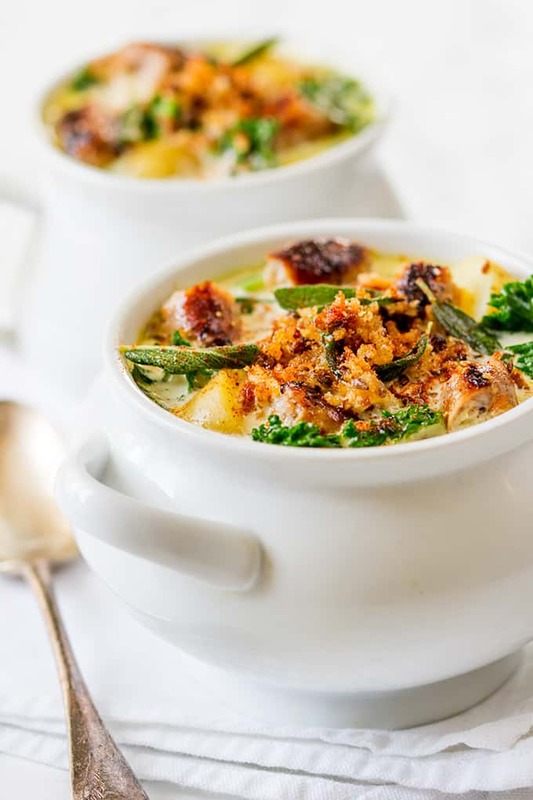 Ladle the soup into bowls and top with the crispy breadcrumbs and sage. Sprinkle on a pinch of paprika and black pepper and serve. Nutritional Information is per serving, based on 4 servings. Fab filling bowl of soup, definitely one of my favourite soups EVER. I turned on my computer this morning thinking I must look for a new recipe for the sausages I had defrosted overnight and immediately spotted your new post. Made it tonight- absolutely delicious!! This looks incredible! Sausages and secretly my all time favourite food, I would pay good money to eat this! Nom! !